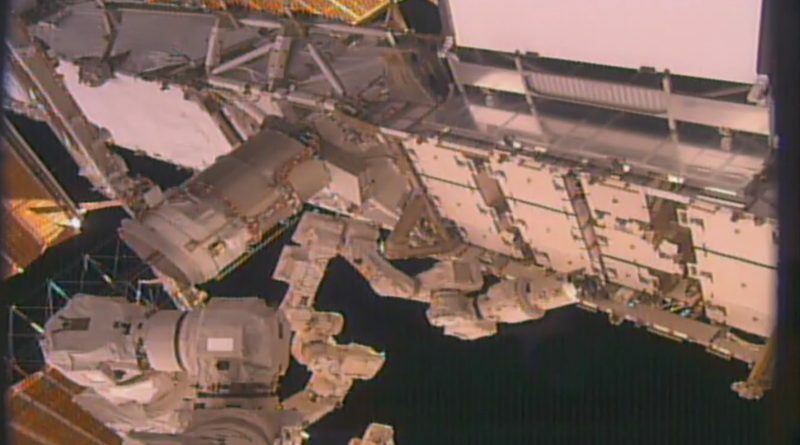 Robotics were underway aboard the International Space Station this week to set up for the arrival of a new set of batteries later this year to replace aging batteries installed on the Station’s truss segments. The work, carried out by the Station’s Dextre robot, involved loosening a number of bolts to ease the removal of the battery systems by spacewalking astronauts when the new units have arrived on ISS. Dependable batteries are an absolute necessity for the operation of the International Space Station, constantly drifting in and out of orbital night. For an average of 35 minutes per lap around the planet, ISS is in darkness and its batteries must take over for the solar arrays. To ensure the station can run efficiently through the end of its operation in the late 2020s, development of a lithium-ion battery-based system was started to replace the nickel-hydrogen batteries that powered ISS for the first part of its stay in orbit. Li-ion batteries weigh less but offer higher power – one Li-ion battery can replace two of the older NiH battery units and their operational life is almost twice as long as that of the Nickel-Hydrogen batteries. Six Japanese-built Li-Ion Battery Orbital Replacement Units are set for launch on the Exposed Pallet of the H-II Transfer Vehicle 6, currently looking at a notional launch date on October 1. These batteries will be installed on the S4 truss segment via two EVAs in which the spacewalkers, assisted by the Station’s robots, will remove the old batteries and put the new ones in their place. The Station’s batteries reside out on the Truss Segments, in close proximity to the solar arrays. The batteries are installed on what is known as Integrated Equipment Assemblies – large platforms hosting power system components. 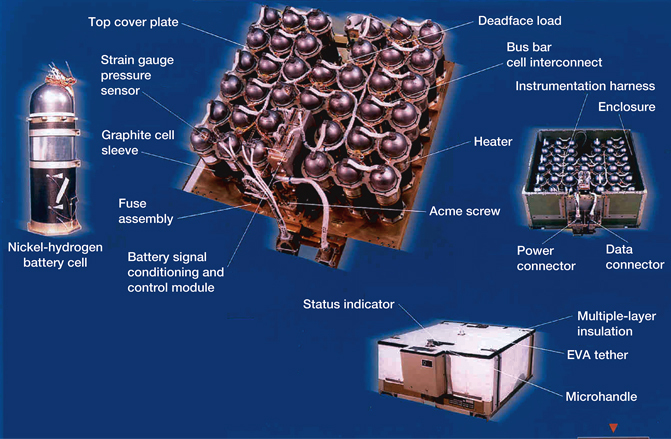 Integrated Equipment Assemblies are installed on the P4, P6, S4 and S6 truss segments and each contains 12 Battery Subassembly Orbital Replacement Units (ORUs), six Battery Charge/Discharge Unit ORUs, two Direct Current Switching Unit ORUs, two Photovoltaic Controller Unit ORUs, and the Photovoltaic Thermal Control System. Each Battery ORU measures 104 by 94 by 48 centimeters in size with a mass of 169 Kilograms. Currently, each of the batteries is comprised of 38 cells plus a Battery Signal Conditioning and Control Module that delivers sensor data and controls the operation of the battery. To set up for the replacement of the S4 battery ORUs during the HTV-6 mission later this year, the Dextre robot was tasked with loosening a number of bolts. Each ORU is held in place by a Flight Releasable Attachment Mechanism (FRAM) which uses a structural attachment system actuated by a pair of bolts – a primary (H2) and secondary bolt (H1). 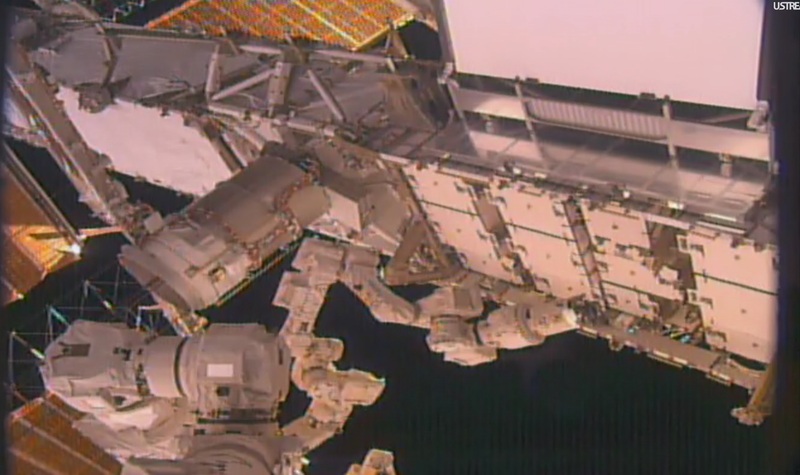 The goal for Dextre was to fully release all secondary bolts and breaking torque on the primary bolts followed by re-torquing them at a lower setting so that future actuation of the bolts will not cause any trouble – either by Astronauts or the Station’s robotic handyman. Robotics started back on April 20 when the Special Purpose Dexterous Manipulator (SPDM) was unstowed from the Mobile Base System for a detailed round of checkouts before starting the battery task. 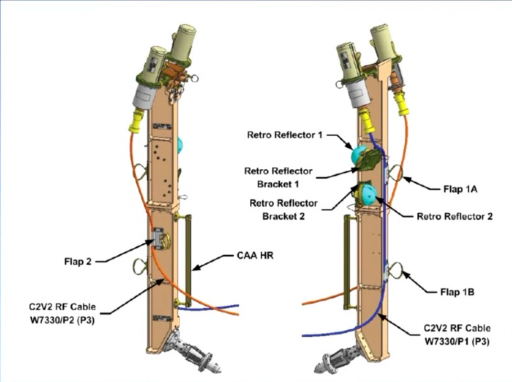 Issues were encountered when the Dextre robot’s ORU Tool Changeout Mechanism 1 (OTCM #1) attempted to grasp the Robotic Offset Tool (ROST) needed for the bolt actuation. OTCM stopped short of the expected gripper close range and teams on the ground began troubleshooting by having the OTCM complete a series of free space grips during which the grasping failure came up again. The first attempt of Dextre’s jaws to grapple the ROST tool in February had to be deferred due to similar grappling issues. Over the weekend, the grapple was finally completed and good functionality of ROST was confirmed. 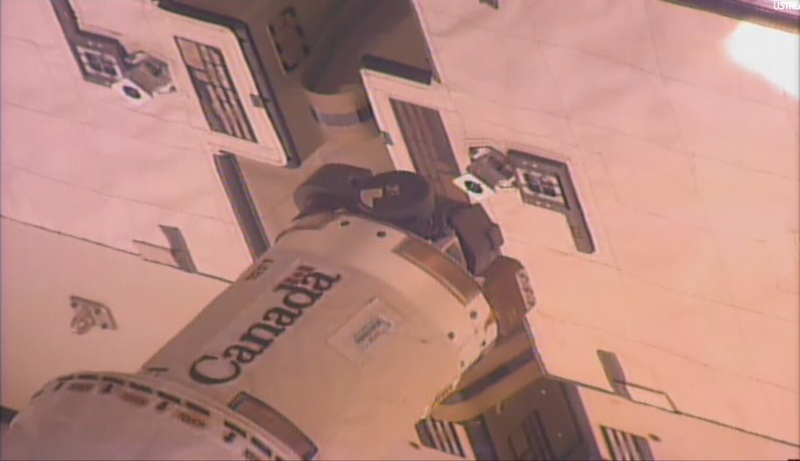 Dextre was moved into position on the S4 truss segment with access to the six 3A battery units (feeding power channel 3A, one of eight operational power channels). Robotic operations were in full swing on Monday with ROBO controllers on the ground in charge of commanding the Station’s robotic duo. Success was achieved with 6 of the 12 bolts, two bolts could not be released and four had yet to be attempted because the operation ran out of time on the first day. On Tuesday, the team successfully completed another five bolts, leaving only the secondary bolt of battery 3A2 to be released. 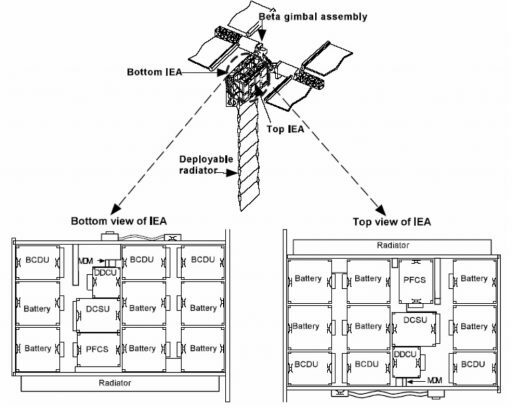 While teams assessed whether the maximum commanded torque could be increased to retry the bolt, Dextre was moved over to the 1A batteries, also located on the S4 truss segment. Operations at 1A were in full swing throughout the day on Thursday. The current plan is for the first set of new batteries to fly to ISS aboard the HTV-6 spacecraft penciled in for launch in October. HTV-6 is set for a stay of 52 Days, facilitating the extraction of the Exposed Pallet from the craft’s Unpressurized Logistics Carrier. 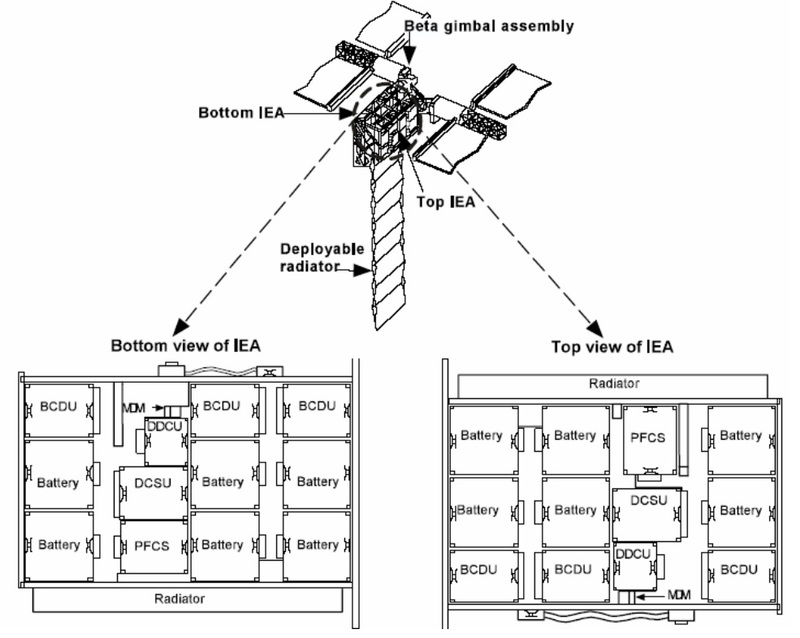 The EP will be temp-stowed on a location on ISS so that the new batteries can be accessed. Based on experience-gathering operations completed in February, teams expect to use the Dextre robot for some tasks involving the handling of battery ORUs and their transfer from one location to another. This robotic assistance will reduce the number of EVAs required for the battery replacement from around six to just two excursions. 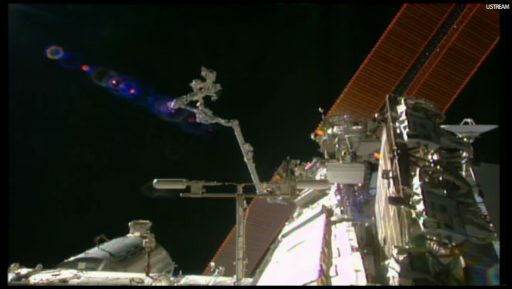 The two spacewalks are planned in the first half of the HTV-6 mission with four contingency EVAs already worked into the schedule of the second half of the mission in order to protect for the event of problems with the robotic handling of batteries or any other unforeseen issues. In addition to a busy robotics schedule, ISS started a critical testing campaign this week involving the Common Communications for Visiting Vehicles (C2V2) System, a critical piece of infrastructure established on ISS for the support of Commercial Crew Traffic beginning with initial test flights in 2017. The C2V2 system is comprised of external antenna systems and internal radio units and processing electronics to allow ISS to communicate with approaching Visiting Vehicles, exchanging relative navigation data and providing a voice link between the two craft. 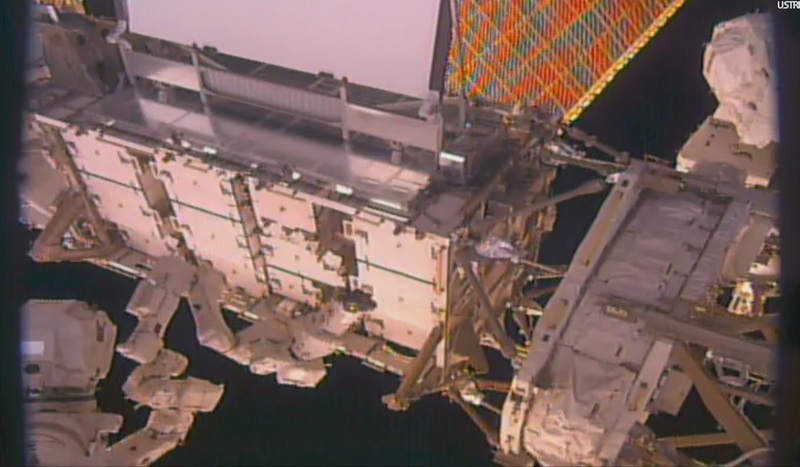 The external C2V2 equipment was installed in March 2015 in a spacewalk performed by Barry Wilmore and Terry Virts. A pair of antenna booms was put in place on the S3 and P3 truss segments, retroreflectors to guide vehicles to their docking ports were installed and four cables were laid down from the truss to the Station’s modules to provide data and electrical connectivity to the antenna system. The internal components for C2V2, specifically two fully redundant C2V2 Communications Units, were installed in the Destiny Laboratory in March and connected to the antenna lines and ISS command and control systems. An initial aliveness check of the new system was finished on April 1st, confirming all electronics of the C2V2 system were up and running. 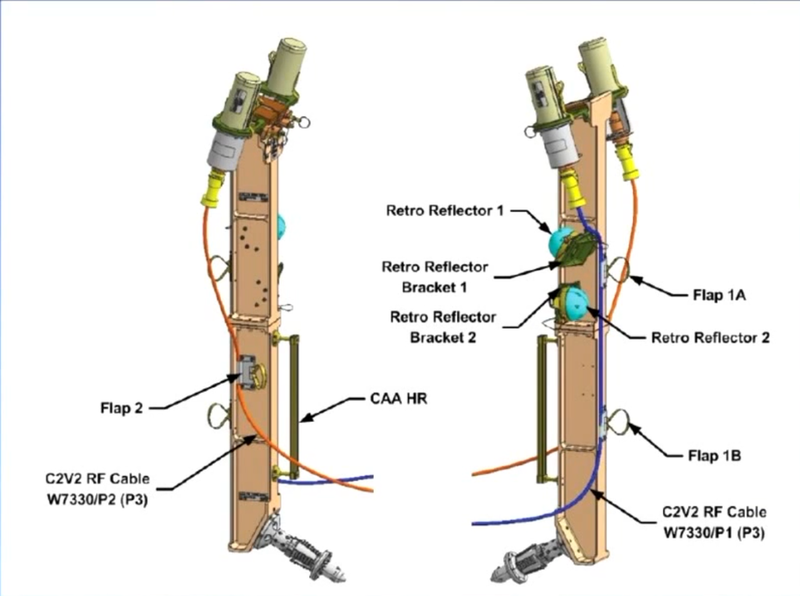 A detailed test campaign was initiated on Monday and is expected to run through May 6 to complete radio checks with C2V2 to verify the primary and redundant strings can connect to visiting vehicles and carry the necessary data for rendezvous operations. On Monday, the C2V2-A radio system completed an eight-minute communications pass with a ground station, successfully transmitting still frames, showing that the A-String forward and aft antennas are functioning as planned. A pair of tests followed on Tuesday, involving the C2V2-A system sending commands and GPS Auxiliary Data (GAD) to the Electronic System Test Laboratory – a simulated visiting vehicle. The second test saw the system successfully transmitting GAD, audio, and Broadcast Auxiliary Data confirmed through the test laboratory and a good communications check through Space-to-Ground 4. Additional forward and return link checks on the C2V2-A system occurred on Wednesday. Heading into the new week, teams will repeat testing on the C2V2-B system to make sure ISS has two functioning systems in readiness for the start of Commercial Crew Missions. 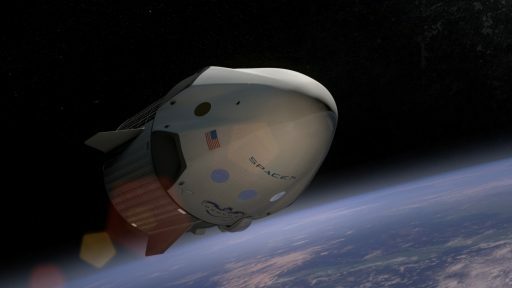 SpaceX is currently looking at an uncrewed test flight of the Dragon 2 spacecraft No-Earlier-Than January 2017 to be followed by a crewed test flight to ISS in the August/September time frame. 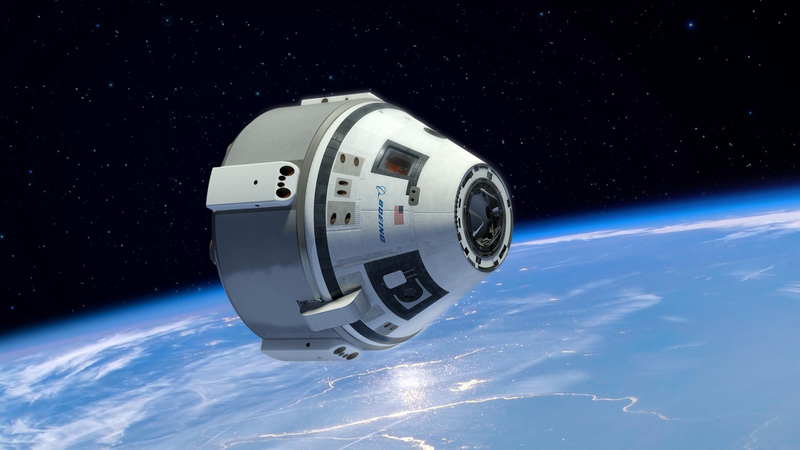 Boeing’s CST-100 Starliner spacecraft is aiming for its maiden flight in June 2017 and the first crewed mission in October.